A variety of insects can damage wood. Some of them actually eat the wood, while others destroy it when they burrow into the wood to create nests. Small holes or sawdust on the surface of the wood can indicate damage by insects, but in some cases, damage isn’t visible to the naked eye. Termites are winged insects that live on the cellulose in wood, and they create a series of tunnels in the wood as they chew through it. On the surface, the wood looks perfectly fine, but it crumbles if prodded with a screwdriver or other tool. Subterranean and drywood termites are two of the most common types. Subterranean termites build a nest underground and need moisture to survive. They infest wood closest to the soil, often in damp basements, and are frequently found in foundation joists and structural lumber. As their name implies, drywood termites eat dry wood found in structural lumber, fence posts and dead tree limbs. They don’t nest underground and enter your home above ground. Carpenter ants don’t eat wood, but they burrow into it in order to build nests. These large ants come in a variety of colors depending on species, including red, black, yellow and brown. Some carpenter ants have wings, just like termites. While termites have wings of equal length, the carpenter ant’s front wings are longer than the back wings. 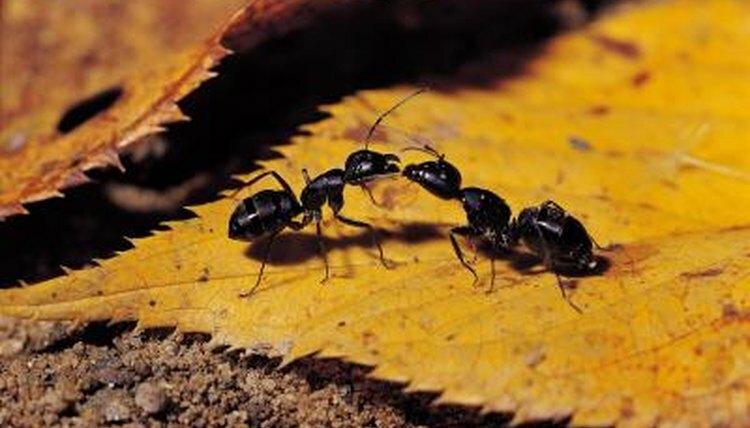 Rotting wood gives carpenter ants the perfect entry point into your home. You’ll often find them in basements or around rotting wood near window sills or leaky pipes. Piles of wood shavings can indicate that you have a carpenter ant infestation. Powderpost beetles are small brown beetles with elongated bodies and small heads. They range in size from 1/8 to 3/4 inches in length, depending on the species. Powderpost beetles lay their eggs on top of wood or just below the surface of the wood. When the eggs hatch, the larvae feeds on the wood, chewing a tunnel to the surface over the course of one to five years. The beetles eat both hard and softwoods. The type of wood eaten depends on the species, and damage is often found in floors, planks, paneling, door frames, furniture and molding. Wood borers are a group of insects that eat trees, acorns and nuts. These insects create holes in wood when they exit as larvae, but don’t structurally damage the wood. Common types of wood boring insects include metallic wood borers, wood wasps, bark beetles and long-horned beetles. Appearance varies depending on the species. Some, like the 1/8-inch-long bark beetle, are tiny, while others, like the 2-inch-long long-horned beetle, are quite large. Wood borers are often found in firewood, log homes or structural wood. The University of Minnesota Extension Service notes that lumber or firewood taken from dead, dying or diseased trees is more likely to contain wood-boring insects than wood from healthy trees.